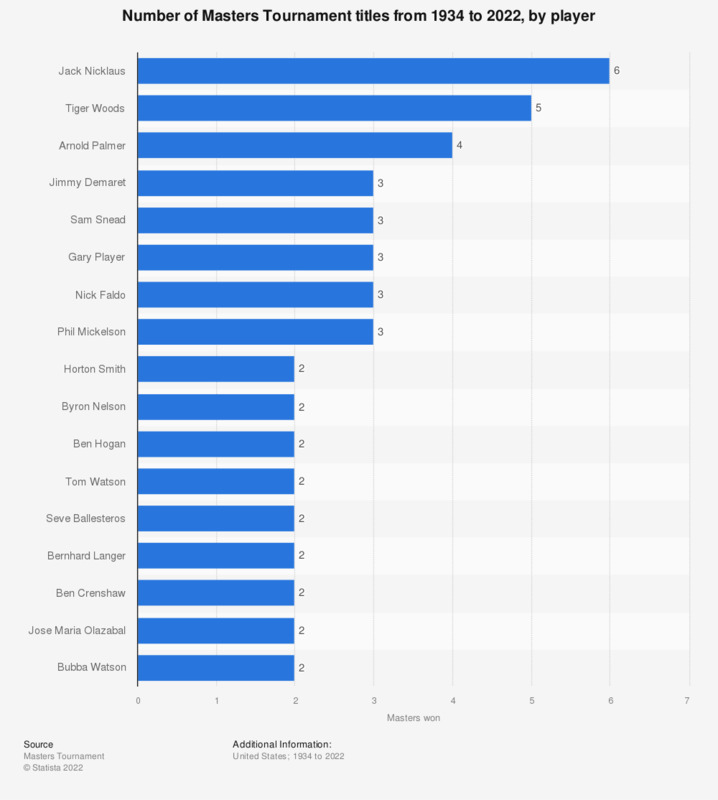 The ranking shows golf players with the most victories at the Masters Tournament from 1934 to 2018. Tiger Woods has won the Masters Tournament, which is held at the Augusta National Golf Club, four times. The Masters Tournament is an invitation-only golf championship played annually at the Augusta National Golf Club, a private golf club in Augusta, Georgia, USA. The tournament started in 1934 and it is always held in the first full week of April. The winner of the tournament, aside of receiving a replica of the Masters Trophy and a gold medal, receives the Green Jacket. The winner is presented his Green Jacket by the defending champion at a traditional prize-winning ceremony. The Masters Tournament is the kickoff for the major championship season. In 2015, the Masters had the highest average TV viewership of major golf tournaments. About 12.4 million people watched the Masters in 2016, which is more than double the PGA Championship viewership that year. Jack Nicklaus, nicknamed “The Golden Bear”, has won six Masters Tournaments, the highest number to date. Having won of one of these titles at the age of 46, Nicklaus is also the oldest winner of the championship. Tiger Woods, one of the most valuable sports athlete brands in 2017, was the youngest Masters champion, winning the prestigious tournament at the age of 21. Woods is tied in number of Masters victories with Arnold Palmer; each golfer has won the Masters four times. Jimmy Demaret, Sam Snead, Gary Player, Nick Faldo and Phil Mickelson have all won the tournament three times each. The English professional golfer Daniel Willett was the 2016 Masters Tournament winner, after narrowly beating the 2015 Masters champion, Jordan Spieth. This is the second time an Englishman has won the Masters Tournament, as a vast majority of the tournament winners have been Americans. The most recent tournament in 2018 was won by the American, Patrick Reed.